with over 24 years experience. Eversil Roof Coatings, LLC is a local, family, woman owned and operated roofing company in Tucson. As dependable Tucson roofing contractors we offer roof coating, roof repair, new roofs flat roofs, commercial roofing and any other roofing services you may need. Our mission at EverSil Roof Coatings is to be the best Tucson roofing contractors and to care for each home or business as if it were our own by giving our customers only the best materials and workmanship in the business. We strive to provide qualiity roofing at an affordable rate and have put together the perfect team of people that each specialize in what they do to bring to you the best Tucson roofing services available. At EverSil Roof Coatings we firmly believe that attention to detail and the proper prep work done on the roof is the most important part of giving a premium roof system that will give you superior leak protection and will last much longer. We know that the right preparation work done to a roof is what gives it the ability to withstand harsh weather conditions. This quality is what sets us apart from our competition. Eversil Roof Coatings specializes in flat roof coating. We are a Flat Roof Specialist and “Certified Applicators” offering Premium Quality Elastomeric Roof Coatings. Our coatings are highly reflective keeping your home cooler while saving you money on your utilities. Also available is a 50 YEAR SEAMLESS FLAT ROOF SYSTEM! EverSil Roofing specializes in all Tucson roof repair including roof leaks, broken tiles, water ponding, storm damage and more. We care about our customers and appreciate everyone that chooses our company as their Tucson roofing contractors. If you have any questions about our roofing services or the products we use, please call us anytime. We are always there to help. We are on call 24/7 to better serve you and we are there when YOU need us. 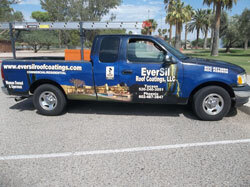 When you need Tucson roofers, think EverSil Roof Coatings! One of the Premier Roofing Contractors Tucson. All Work comes with a Warranty.